I started making some chicks for my DQS8 quilt. I am going to make twin quilts this time and keep one. I'm making mod chicks and traditional chicks. Cute, huh? Ok, they will look more like chicks when the seam allowances are sewn and details are embroidered. Can you believe I enlarged the pattern for these 200%? I am also going to make some eggs. they look cute already...enlarged 200%??? yikes! Sounds so cute! I can't wait to see this when it's done : ). Guess I'll have to see them finished to be convinced they are chicks. Hope it's soon! Can't stand the suspense. Great article you got here. It would be great to read more concerning this theme. The only thing it would also be great to see on this blog is a few pics of any gizmos. These are really cute and such a good idea. soooo cute!! I can't wait to see them finished! 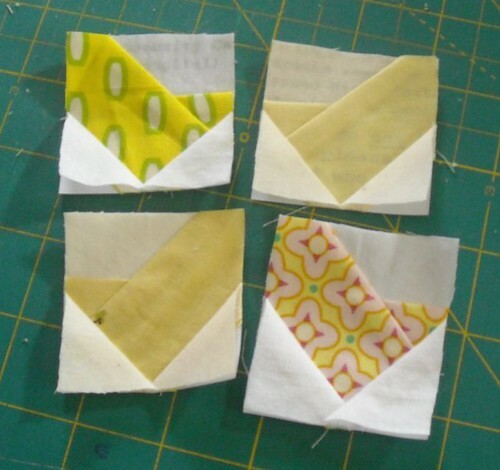 I need to work on my DQS8 quiltie too! doll quilt finish--"Six of One"
thank you for voting for me!